At the private view opening of the third edition of the Affordable Art Fair Singapore on the evening of 14 November, there was a palpable buzz as invited guests imbibed the free-flowing Mumm champagne and mingled over exciting contemporary art from 85 local and international art galleries spread out over 2 floors of the F1 Pit Building. The fair showcases a wide-ranging collection of high-quality contemporary art from abstract to figurative, including paintings, sculpture, photography and prints. 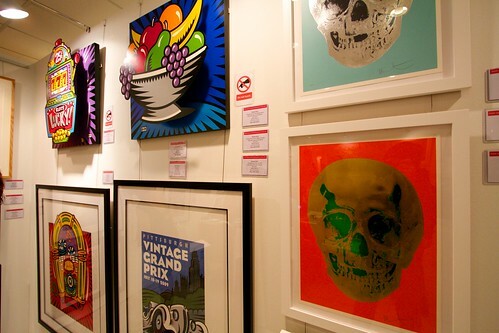 All work is original and priced between S$100 to S$10,000, with 75% of the work under S$7,500. The works of young, emerging artists are displayed alongside those of celebrity artists. While the Young Talent Exhibition offers a platform to artists aged 30 and under and provides visitors with a chance to snap up what could be a future masterpiece! As I wander around the stands, I revel in the diversity of the art on show. Local gallery Give Art Space has prints from acclaimed Singaporean artist Michael Lee, while ReDot Fine Art Gallery, another local gallery showcases contemporary aboriginal art. I have a soft spot for butterflies and Rebecca Coles’ Stamp Series from Mark Jason Gallery caught my eye. Coles hand cuts butterfly silhouettes from recycled stamps and pins them up using entomology pins akin to “live” specimens. At Villa Del Arte Galleries, Willy Rojas’ playful and humorous photos have great visual impact. His miniature worlds: tiny plastic figures, just centimetres tall, carrying out activities in kooky scenarios, are simply brilliant. In Sunny Side Up we see scuba divers swimming in the yolk of a fried egg, while Melon has swimmers frolicking in a watermelon. Parn Klangnok is a new generation Thai artist represented by Goldmann Inc. whose works often feature hybrid characters set amidst surreal scenic backdrops and each has a story. I am tickled by his watercolour on paper of a glamorous girl called Sarah Pine who is a secretary and secret agent. Her after-work activities including exercising and shooting and her favourite thing is Christian Louboutin shoes: A girl after my own heart! At Panter & Hall’s stand, I am immediately drawn to Donald MacDonald’s whimsical photo realistic oil paintings. The sweetness and innocence in The Butterfly Giver touches a chord in me. With fun and educational printmaking demonstrations, art talks by experts and a children’s art studio offering fun activities for the little ones, the Affordable Art Fair has something for everyone in the family. And whether you are a seasoned collector or a newbie on the hunt for your first piece of art, the Affordable Art Fair promises to surprise and delight. 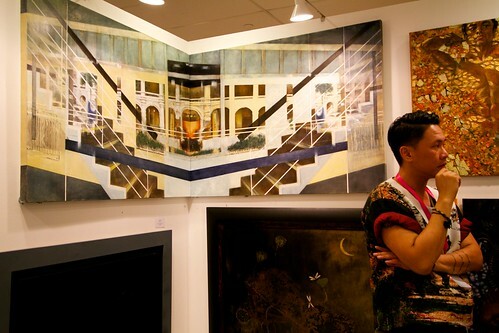 View our Affordable Art Fair Singapore 2012 album. Texts by Geraldine Lee and photographs taken by: Karen Mitchell, Wei Teck and Eric Lim, unless indicated otherwise. 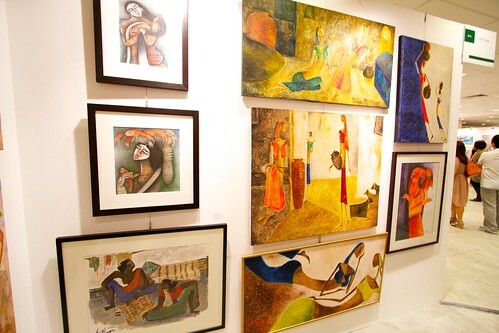 The Affordable Art Fair is on till Sunday 18 November at the F1 Pit Building, 1 Republic Boulevard.